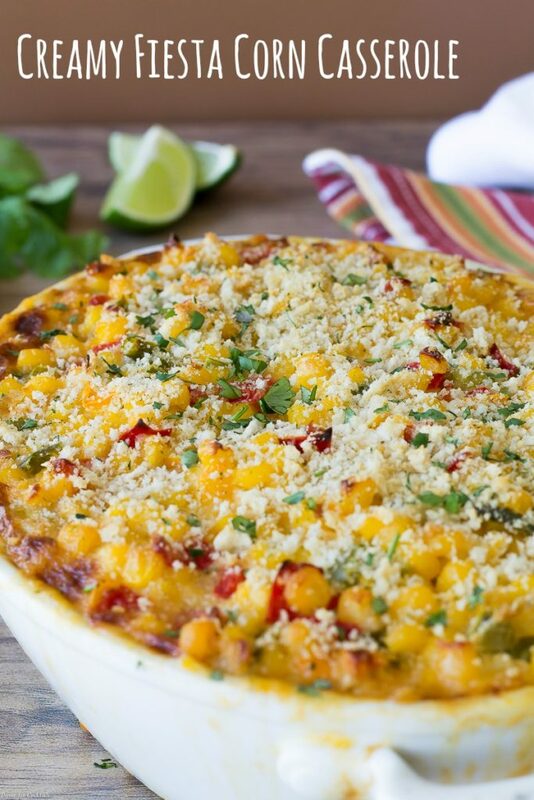 When the time comes that you need a great dish to share at your next potluck reach for this Creamy Fiesta Corn Casserole recipe. It is packed with fresh peppers which you can find in any supermarket pretty much year round. I used a variety of bell peppers but it is equally delicious with canned green chiles or fresh poblano peppers. Jalapeño peppers add a nice kick too! Don’t worry though, it’s not too spicy. There’s plenty of sour cream or if you want – substitute Greek yogurt – to balance out the peppers. Frozen corn is hands down one of my favorite kitchen staples. We eat a lot of Tex-Mex dishes like this Warm Southwest Farro Salad and my Chipotle Corn Chowder. It’s super versatile in salsa and fried rice too! Also frozen vegetables are a great way to enjoy produce that may not be in season. 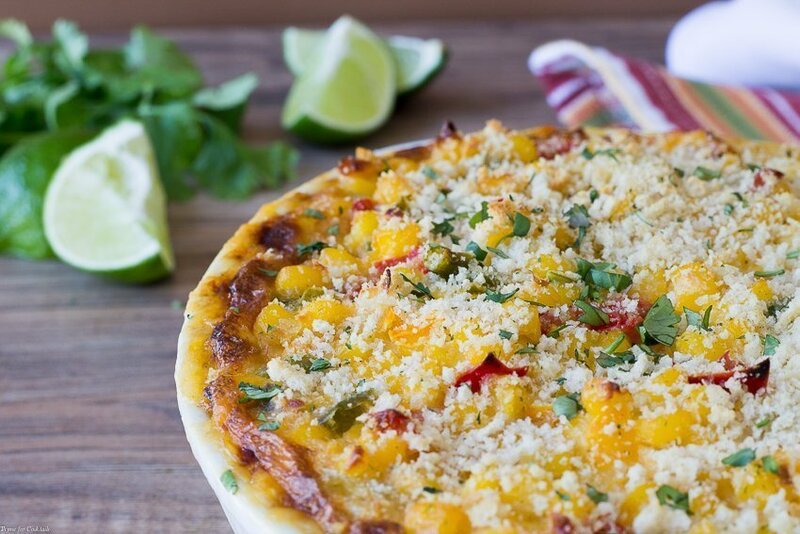 You can for sure make this Creamy Fiesta Corn Casserole with fresh kernels once those golden ears of goodness start popping up at the farmers market. Fresh corn is in season starting in June and will last through October in most parts of the country. This Seasonal Food Guide is a great resource to find out what’s available in your neck of the woods and when! In the meantime frozen corn is easily accessible and very affordable. I hope you like my Creamy Fiesta Corn Casserole as much as my crew does. If you love this Tex-Mex inspired recipe, you can find more like it by checking out my Side Dish section! For recipe inspiration delivered to your inbox, subscribe to my newsletter, follow my photography journey on Instagram, and for generally inappropriate humor follow like me on Facebook! 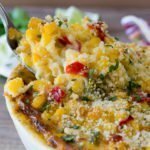 Creamy casserole made with corn and peppers in a cheesy sour cream sauce topped with crispy breadcrumbs. Pre-heat oven to 350°F. Butter or spray a 9x9 inch baking dish with non-stick spray. Set aside. Heat olive oil and butter in a large Dutch oven over medium heat. Add onion onions and peppers, sauté 3-4 minutes. Stir in garlic, cook for 1-2 minutes. Sprinkle in flour, cook for 1 minute. Stir in chicken stock. Stir in half and half, sour cream and cheese. Fold corn into cream mixture, salt and pepper to taste. 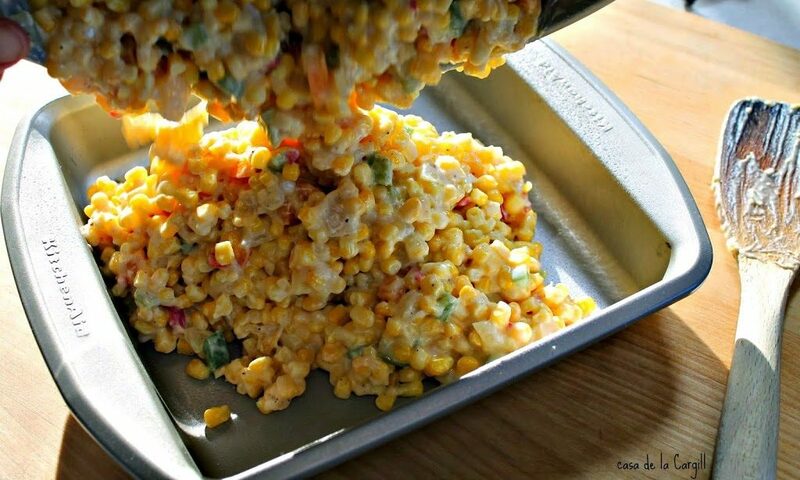 Pour corn mixture into baking dish. Top with bread crumbs and bake 20-25 minutes until brown and bubbly. Tip - Gently thaw frozen vegetables by placing them in a colander and run under warm water for 30 seconds. Oh WOW!!!! You have a new fan here! This is right up my alley! Seriously! Thanks Aunt Bee! I am originally from the Midwest & lived in the South for 5 years before moving to Phoenix, AZ. It has really influenced my cooking!